This year I've been experimenting with tomatoes in containers in the greenhouse, and was wondering how to build a tomato trellis that I could move with the containers. My standard tomato trellis option using pounded in posts was not going to work. While I was thinking, I got an email from Dominic of Better Bilt Products, offering to send me some of their Vine Spine™ garden trellises to try out in the garden – plus a set for a lucky reader. Here's my take on why the Vine Spine™ is the best all-purpose garden trellis I've seen to date. 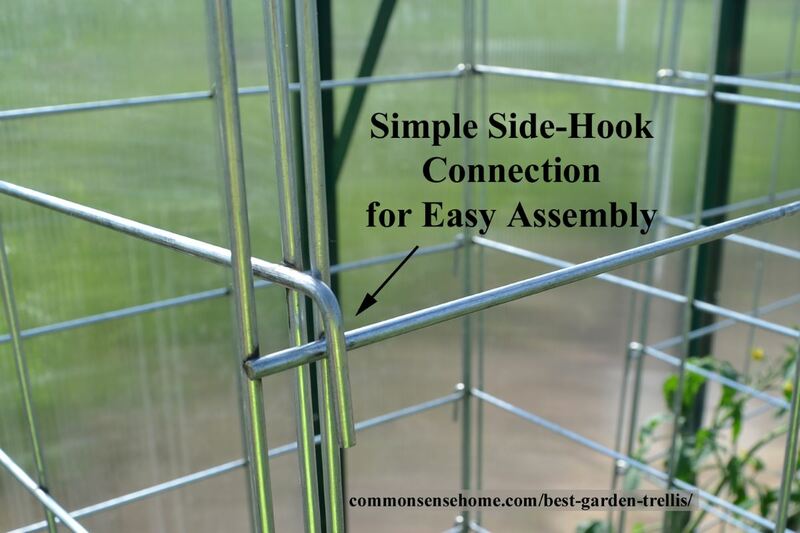 You can use the side-hook connectors to link a series of trellis boxes into a wall for wind resistance and extra support. You can arrange the boxes as a “zigzag” support for a hedge or row of beans or peas, or tethered flat against a wall or other upright support for vertical gardening or espalier applications. 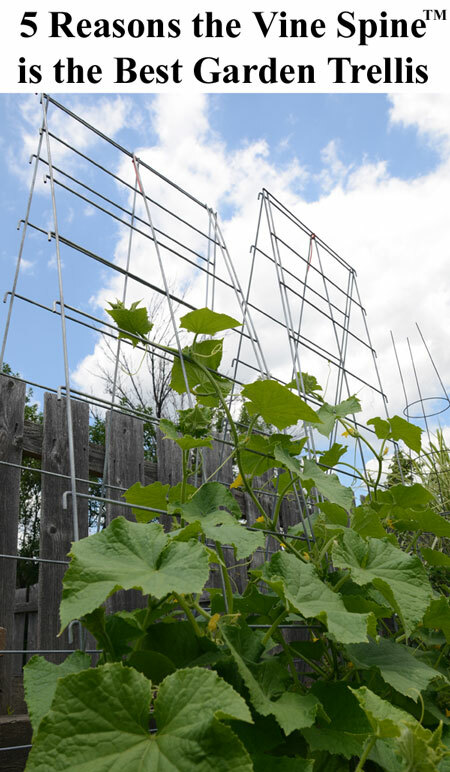 For vining crops such as cucumbers, squash or pole beans, you can choose an A-frame arrangement to get the vines up off the ground, improving air circulation and reducing the risk of rodent damage. Finally, the panels can also be locked together to form a frame for a floating row cover or plastic to create a mini-greenhouse. I don't know about you, but I have found those flimsy circular garden plant support sold in most home improvement stores to be a bad joke. Mom tried them for everything from flowers to tomatoes, and every single time either the plant got too big for the support, or the trellis tipped over in a wind storm. I've been stuck using them a couple of times over the years when we were switching homes, and I had the same results. I always thought it was cool that the boys' Duplo block pieces worked together with their regular Lego pieces, so that as they grew, they could use both sets together. With the Vine Spine™ garden trellis panels, you can mix together the panels with 6″ and 12″ openings however you like. In my case, when I used them to box in my tomato plants in the greenhouse, I made sure that each plant had at least one panel with 12″ openings so it was easier to get my watering container in close to the pot. At the end of the season, it's always a challenge to gather up the various supports and ground covers used in the garden and pack them up for storage. With the Vine Spine™ garden trellis modular design, you simply unhook the panels and lay them flat for storage. No wrestling with big circle cages, and they go back together in seconds when it's time to use them again. It is helpful to have two people on hand when you're connecting multiple cages to make sure everything lines up correctly. Each panel is made with heavy duty 3/16″ galvanized wire for durability, strength, and weather resistance to provide you with many years of use. These trellises are made to last. 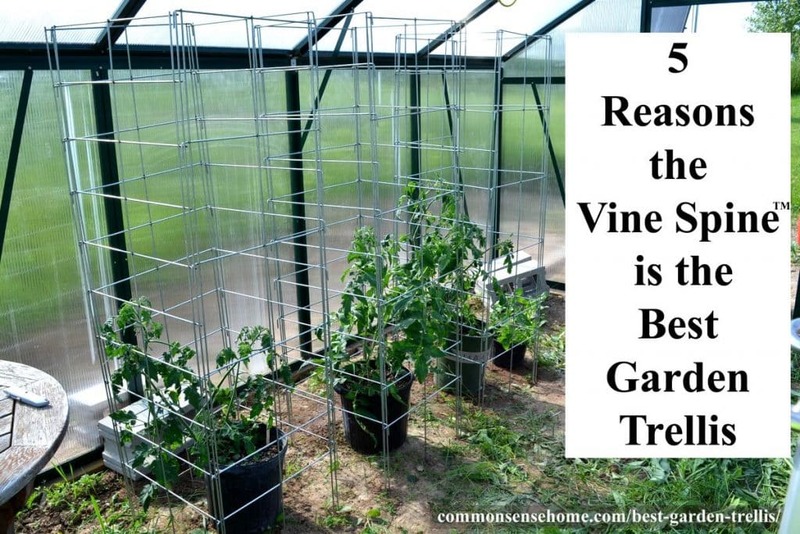 Ready to get your own Vine Spine garden trellis? Just visit Better Bilt Products, Inc..
How much do the trellis panels cost? Our “4 pack” includes 4 panels, and our “12 pack” includes 12 panels. As for what configuration one chooses to do, with say a 4 pack (square, 4 panel hedge, two a-frames, etc. ), that is up to a gardener’s imagination. When talking price comparisons retail to retail, we offer a very competitive value. I’m sure you are familiar with Gardener’s Supply? 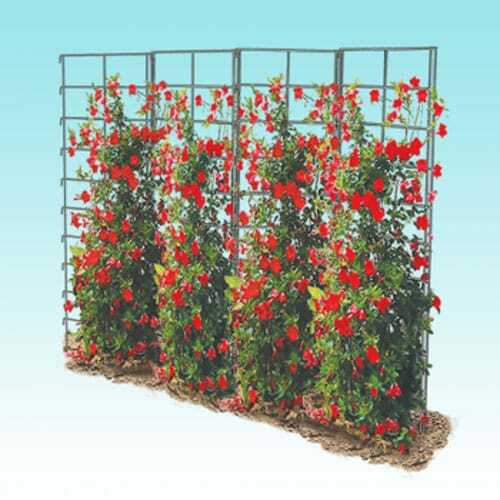 They offer 6-7 different wire trellis product options, whereas our system offers all 6-7 of theirs in 1 product. Currently, we make other products using the same galvanized wire and have told our customers they would last 10+ years (see our Top Hat Container Stabilizers as an example at http://www.bbponline.com/plant-container-stabilizers/top-hat/). And after 7+ years – no complaints! As you said, these would be an investment for a gardener. I ask myself a question when it comes down to making a decision on a product like this: What is the cost of convenience? For a gardener to make their own trellis system as an example, they have to access a truck that can carry 16’ hog panels, and they must have the time and tools to fabricate to their own desired specs. We feel a large percentage of your average gardeners won’t have the means to haul, nor do they want to take the time to fabricate themselves. Our 4 pack and 12 pack pricing includes delivery across the continental US right to one’s doorstep, ready to use right out of the box. My boss has a saying that I like to use when comparing our trellises vs. the competition: “The most expensive thing you can buy is poor quality.” Certainly has a nice ring and truth to it. I'd also like to note that Better Bilt sells wire supports to keep pots from tipping over in the wind, and a variety of smaller trellises for lighter jobs, plus an easy to assemble composting system – lots of great tools for the home gardener or professional grower. We’d use them for our tomatoes. That’s what we grow mostly besides root vegetables. Thanks for the chance to win! These supports look fantastic. We’ve tried just about every type of support made, including strings this year, but these look to be much sturdier. These look wonderful. Would love to add them to my garden for beans and cucumbers. Oh, these are AWESOME!! I really NEED them. 🙂 I garden in a community garden where there are a lot of deer.. but because my plot is small and area limited, I have to grow some of my veggies, cukes, spaghetti squash, and peas on the wire enclosures.. I could use these in a tee pee type configuration and keep the deer (& people) from eating my goods that are growing on the outside fence. Thanks for the give away! Its the BEST EVER!! When I first glanced at this, I thought it was just another tomato trellis. But once I looked at all the ways it can be used–it’s really versatile. I’m a raised bed gardener, and try to grow up as much as possible. I can see using it as a tomato trellis, but I would use it as a cucumber/melon/squash trellis too. 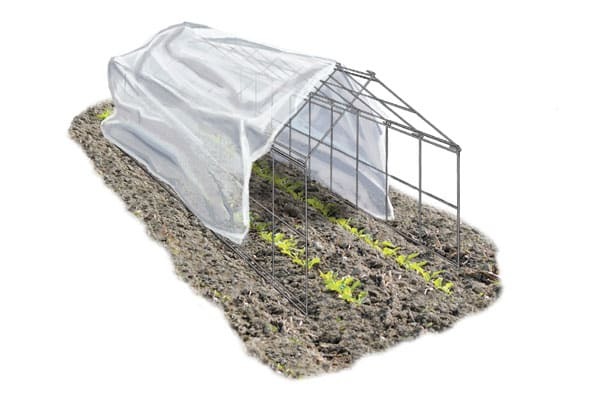 And then, to be able to use it for a cold frame once temps cool down… Awesome idea! I would love to use the A frame setup for my squash, they are taking over! The shelves also sound interesting to lend support to those large spaghetti squash. Thanks for the information and the opportunity to win a set! I grow lots of tomatoes and cucumbers for the senior citizens here in Breckenridge (especially since we’ve been blessed with rain this spring!) These trellises would save me a lot of time by keeping things in order. I’d use them as a trellis for squash. Every year, my squash threaten to take over, and it never fails that about every two weeks, I find a squash that I’d missed until it got HUGE. I tried to enter for the trellis, but I couldn’t make it work for me. maybe next year. I would use them for green beans, lima beans, yard long beans and wing beans. The lima beans and wing beans grow year round here and need very strong supports. Love your blog and website for inspiration. Mahalo from Hawaii. I wish I had these when I began gardening! It would have saved me having to haul home the panels and stakes. But, my garden is always growing; and after 15 years, some things need replacing. I really like the option of rearranging the panels in the winter to form a hot house and keep the garden going year round…. or at least get a head start planting next year. Very ingenious. So, I’m entering the contest and hope to win some Vine Spine Garden Trellis packs! I would use them for my butternut squash. I have some wooden “kitchen ladder” type supports that are rickety. I have had my butternut squash and spaghetti squash growing upward on a variety of jerry-rigged things and would love to try a well made and sturdy A-frame set up for my squash. I would then save up and get many more 4 packs to replace my bamboo bean teepees. I live in a duplex and I rent. These would be great for helping me turn the existing flower beds into my vegetable garden! I could plant squash, beans, tomatoes vertically and take up less of my valuable space! I would use them for the cucumbers and tomatoes! Thanks for the chance to win! I could use them for my cucumbers and tomatoes! what I have right now isn’t enough for my cucumbers to trail along…and having a small yard this would work great! I would use them for cucumbers and melons. A shelf would be nice. I love that these are so versatile. I was just about to buy a cage from Gardener’s Supply for my snap peas because our current system just broke. I love that down the road we can use it for tomatoes or melons. Super awesome product and I LOVE that it’s made in the USA. I’d like to use them on our straw bale garden to hold up tomatoes and other vines. The product looks great. Thanks for the opportunity. I’d use these for everything! These would be awesome to have for my tomatoes and beans. Right now my watermelon vines are climbing the tomato cages and pulling them down. I would use these for vining crops like peas, beans and cucumbers. And for tomatoes. Looks like a great product! Think I’d try them in conjunction with large pots on the deck to grow cucumbers, maybe squash or beans. We just closed on our house and we will use the Vine Spine in our garden. I’d trellis peas, runner beans, cucumbers, squash, & support tomato. Gosh, really need to get a set of these-can replace my 55-60 year old fence wire my dad cut & used for his gardening that I still use bits & pieces of. These look well designed, I LOVE options, and USA made. How sweet it that? I would love to try one out on tomatoes. The round ones I have just don’t support all that well and it is hard to get at the tomatoes when they are ripe. I would love to use these! I would start cucumbers on them. Thanks for the opportunity! Due to our site I only grow things that can be trellised! I’m currently using old box springs as trellises! These look terrific…I love the flexibility! I would love to have these for cucumbers! Love to try if for the beans and tomatoes. If strong enough definitely try it in the squash garden. Love made in USA stuff. So versatile and durability how can I not purchase? Well maybe I’ll win the contest!!! If not my pocketbook will be lighter. Thanks so much for the info. With our fierce desert winds, I always seem to have difficulty keeping my cucumbers & beans off the ground, so I would use these trellises for those crops (as well as others, I’m sure). I would use these as a trellis for vining veggies. They look to be much easier to store in the off season. I would use them for my tomatoes. I’m tired of those big round cages, they just don’t work that well. Just discovered that Muscovy ducks like tomatoes…. they would not get as many if I had these to support some of the closest tomatoes to their wandering area! Hint, Hint. Thank you for the chance to win! either pole beans or cucumbers. These look great. Strong, flexible, durable – perfect. I’d use them for tomatoes, beans, peas and cucumbers. I need trellises or fences to hold up (and hold back) my raspberries. I think the A-frame configuration might work for that. Right now, the berries are mostly out of control and taking over the fences my squash are growing on. I need to hold up (and hold back!) my raspberries, which are taking over my squash trellis. These are really good-looking trellises. These are awesome. I would use them for my tomatoes and cucumbers now and in the future for green beans and other items as well. The shelf option would be interesting to see how it would hold up to the larger items but I would be interested. I recently built several raised beds to use in my yard. These will give me lots of options to grow various items. Love them. I would love to try them on tomatoes. I would like to use it for squash (butternut, kabocha and acorn varieties), beans and melons. My squash has overgrown into my bean patch this year. Will definitely need a trellis for next year. This is the perfect solution to my city-lot backyard garden. The wooden stakes I am using now just aren’t holding up. And the available shelves will add the versatility to use these panels for melons and other large-fruiting vines. Definitely a must-have for next season! I would use these panels in so many ways in my garden, but I’m most excited about trellising my cucumbers. and I’d love to get rid of the squirrelly tomato cages! As I grown squash and melons, the shelf add-on would come in handy, too. Thanks! This would be for my parents garden. I’d use them as a shield so the next-door neighbours have some privacy; as they cut down part of the hedge. And as impetus to start gardening instead of mowing a huge lawn. Thanks. P.S. Culling my blogs I’m following and you make it onto the short-list. Good job. I would use it to grow several varieties of grapes. We’d use these for our tomatoes, beans and cucumbers. This would be a massive upgrade for us since our cages and simple garden stakes seen to always fall. I would use it for snow peas first then for my tomatoes and cucumbers later in spring. What a great idea! There are so many things I could use them for, especially my tomatoes since they got so big last year the wire cages fell over. I am always looking for better ways to garden. 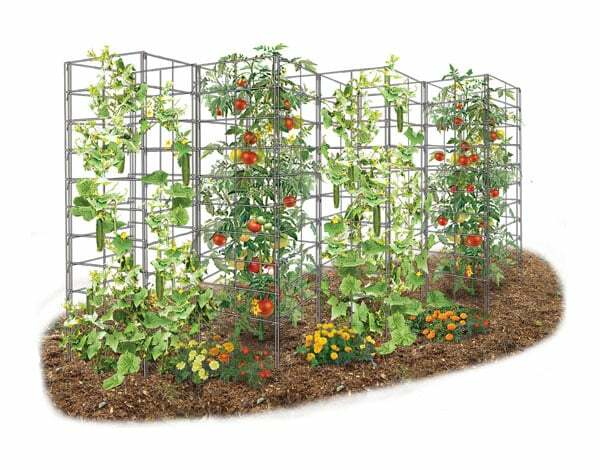 I would definitely try the tomato cage as well as the trellis for beans and peas. If you have a coop or similar bulk buying arrangement in your area, they can do discounts for large purchases. We have some flowers at the back of our house that are toppling over so we’d use them on those and hopefully on tomatoes once we plant some – thanks! These would work great on my tomato plants. Also, I can imagine them up against a side wall covered with Morning Glories. Thanks, Laurie. I’m always amazed at your website! I would love to win these Vine Trellis. I love to grow my own tomatoes and beans. The trellis system would be very helpful to me. Thank you. I would use Vine Spine for tomatoes, cucumbers, squash, etc. Vine Spine sounds like a dream come true! We have round cages that we have made for our tomatoes, but have been wondering about a good option for our climbing vegetables. I love that it is so versatile and can be reconfigured. Would love to win this set!!! I would use it to put plastic over to extend my season. I’d use the Vine Spine to trellis passionflower, also creating privacy for an outdoor clawfoot bathtub. These look just like what I need — sturdy, versatile, and durable. I looked into building my own, but the cost and effort was off-putting. I want ’em! 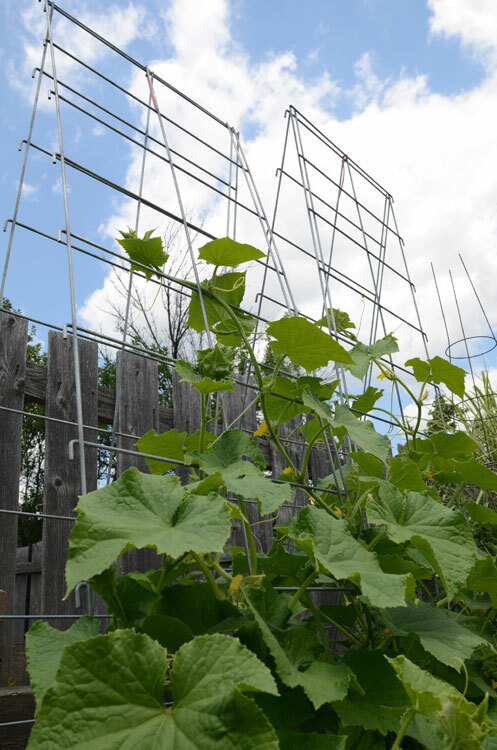 I would use my trellis to support melons, cucumbers, and beans. What a great way to keep produce visible and keep the produce off the ground. Beans and tomatoes and peas all could use these in my garden…. I would love to use these for snow peas and beans! THEY LOOK REALLY STURDY.WOULD LIKE TO HAVE SOME. WOULD USE ON MY CUCUMBERS, TOMATOES. Would definitely use these, for tomatoes, cucumbers, winter squash, the possibilities are endless! We always need more trellises. Would use the A-frame arrangement for vining crops such as spaghetti squash, cucumbers and asparagus beans. The add-on shelf for heavier produce would also be helpful for heavier produce. Thanks, Laurie, for a chance to bring the best garden trellis onto our small homestead. I would use these so many ways! My head is spinning thinking about how useful they would be. I would love to use this system to support my tomatoes, cucumbers zucchini, and cantaloupe. This summer has been my very first time planting a garden, so I’m just starting to scratch the surface of how to do things, and what kinds of products work best. The idea of add on shelves for the trellis sounds great too, since so many of the plants that I’d use it for can grow huge fruits or veggies. Thanks for offering the chance to win a set! These are fantastic ! I am senior citizen and these would be great for my tomatoes or squash , makes it easier on these older bones ! I would like to get my cucumbers off of the ground to keep from feeding the critters.